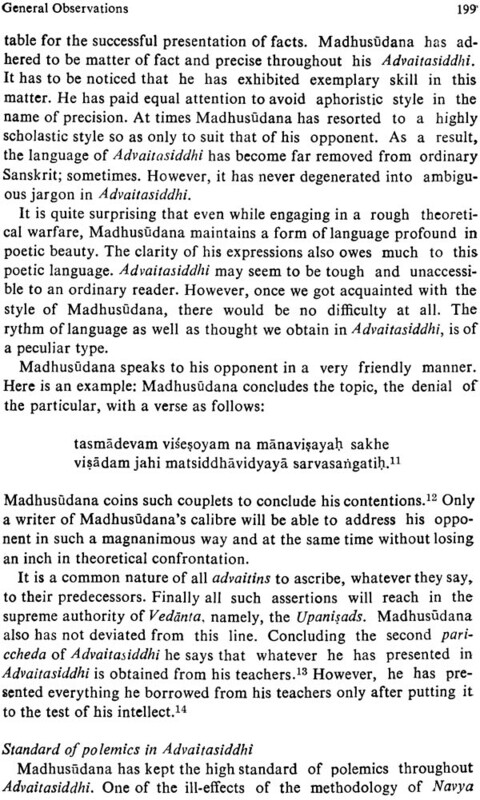 Advaitasiddhi of Madhusudana-sarasvati is one of the best products of the terse theoretical fight that ensued between Dvaitins and Advaitins. The present book is divided into twelve chapters. Chapter one deals with the author, his date, life and works., chapter two is on the Siddhi-literature of the Advaitavedanta school., chapter three deals with the controversy between Dvaitins and Advaitins. Chapter four to eight are on the textual examination of the Paricchedas. Chapter nine is general observations of schematism., chapter eleven highlights the philosophical and other positions of the Advaita as evidenced by Advaitasiddhi., Chapter twelve is the conclusion and over all survey of Advaitasiddhi. The book is published under Sri Garib Dass Oriental Series. K. Maheswaran Nair is presently in the Department of Sanskrit, University of Kerala. He is a member of the Advisory Committee o the Department of Publications of the Government of Kerala. 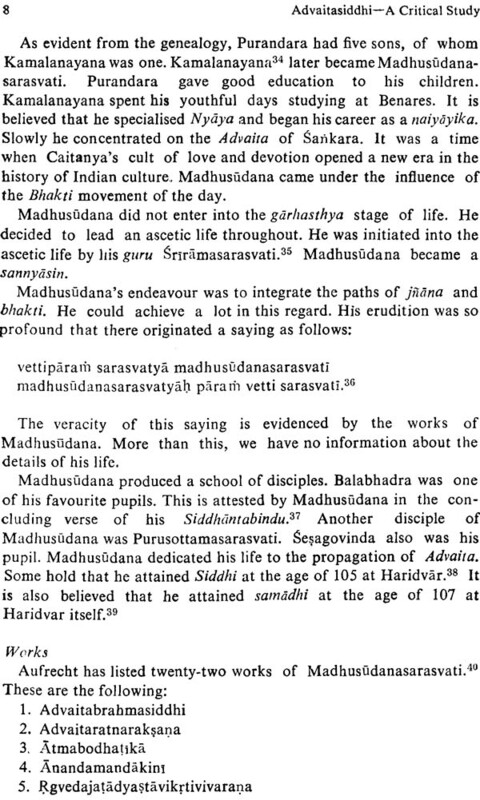 Advaitasiddhi is the magnum opus of Madhusudana-sarasvati who was one of the greatest stalwarts of the philosophy of Advaita. The book is a verbatim reply to Nyayamrta, the masterpiece of Vyasatirtha, the great champion of the philosophy of Dvaita. Nyayamrta and Advaitasiddhi together constitute the fountain-head of neo-Vedanta; both marvel as the best specimens of the controversy between advaitins and advaitins. What is intended in the present book is a modest attempt in the study of Advaitasiddhi. In the study of Advaitasiddhi one has to pass through certain hurdles. In the first place, there is the absence of a complete translated of the text in English. 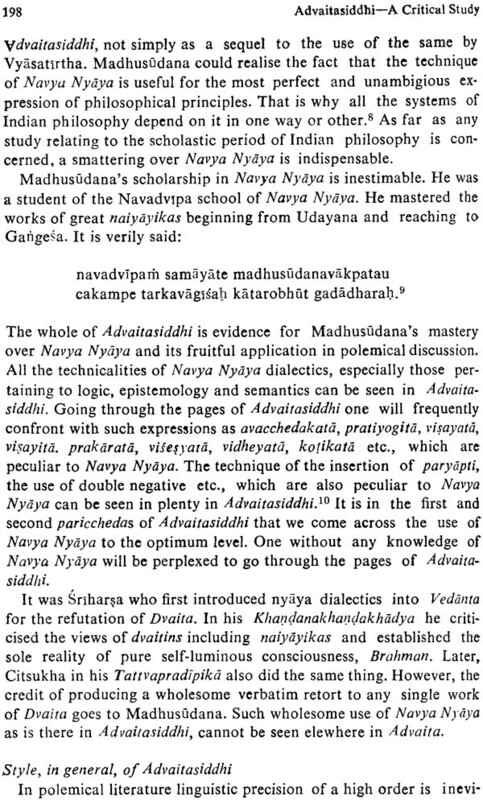 Secondly, since Advaitasiddhi is written employing throughout the method of Navya Nyaya, an acquaintance with the same has to be acquired before embarking upon the study of Advaitasiddhi. 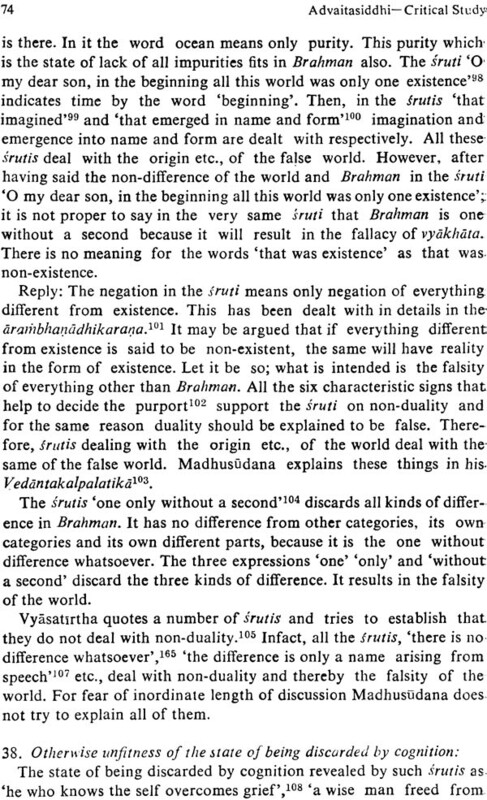 Thirdly, since Advaitasiddhi is a verbatim retort to Nyayamrta the study of the latter is a pre-requisite. I have tried my best to get over these difficulties. 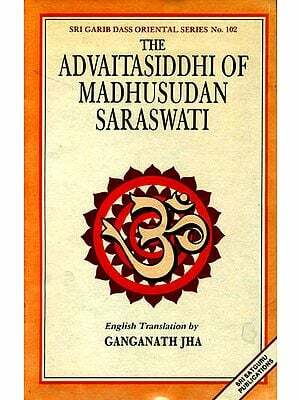 The incomplete English translation of Advaitasiddhi by Pandit Ganganath Jha, though it contains only the first twenty-six topics out of the total of one hundred and twelve, was of immense help to me. I have taken pains to compare the work with Nyayamrta as and when found necessary. The study is divided into three parts each comprising of four chapters. The first part is general. The first chapter deals with the author, his date, life and work. The second chapter is devoted to give an account of the Siddhi literature of the Advaita School. The third chapter presents a brief history of the controversy between dvaitins and advaitins. The fourth chapter refers to the nature, contents and commentaries of Advaitasiddhi. The second part is a textual examination of Advaitasiddhi, which has four paricchedas. The fifth chapter examines the first Pariccheda of advaitasiddhi distributed in sixty-three topics. The sixth chapter examines the second Pariccheda having thirty-five topics. The seventh chapter examines the third Pariccheda in eight topics. The eighth chapter examines the fourth Pariccheda in six topics. The third part is completely devoted to observations and conclusion. The ninth chapter comprises of general observations on Advaitasiddhi. 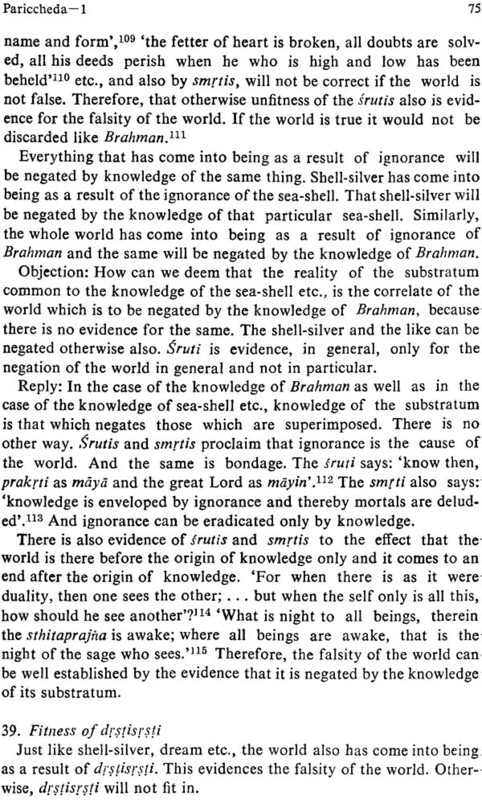 The tenth chapter consists of observations on the schematism of Advaita as evidenced by Advaitasiddhi. The eleventh chapter contains philosophical and other observations. The twelfth chapter is the conclusion. Resume has been given at the end of each chapter. The concluding chapter presents the thesis in a nut-shell. In this study of Advaitasiddhi I have tried to point out its practical relevance. As a result, I hope, the study will cater to the present-day philosophical needs. I have always been keen to be objective in my approach as well as to be brief in presentation. 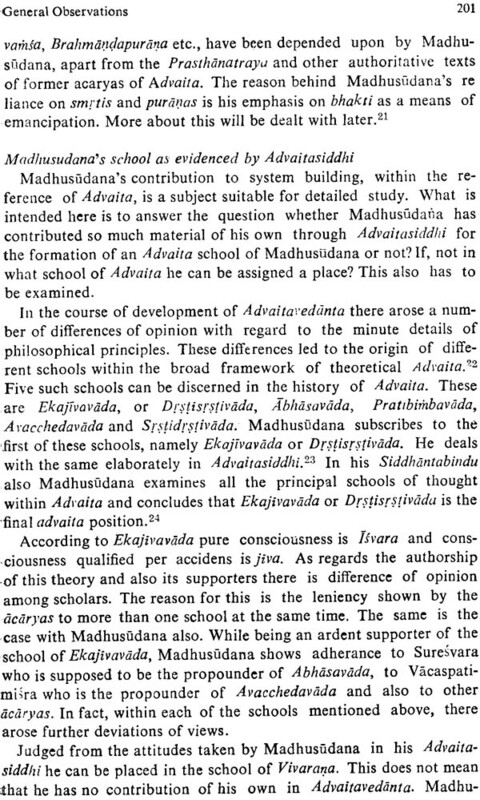 More than one edition of Advaitasiddhi have been utilized in the present study. Unless otherwise specified page numbers of Advaitasiddhi referred to correspond to those of the text along with commentaries edited by Anantakrnasastri, N. S., of the Nirnayasagar edition. The study of Advaitasiddhi was undertaken by me at the instance of the late Dr. S. Venkitasubramonia lyer who was the Professor and Head of the Department of Sanskrit in the University of Kerala. Dr. K. Raghavan Pillai, Director and Professor, O. R. I. and MSS. Library, University of Kerala was my supervising teacher under whose guidance I could do a good deal of my work. Owing to the demise of Dr. Raghavan Pillai, I proceeded with my work under the guidance of Dr. M Sreedharan Menon, Professor and Head of the Department of Sanskrit (Retd. ), University of Calicut. Dr. Menon Professor and Head of the Department of Sanskrit (Retd. ), University of Calicut. Dr. Menon has always been a source of inspiration to me. I express my deep sense of gratitude to him. Dr. T. Bhaskaran, Director and Professor, O. R. I. and MSS. Library, University of Kerala, has always been a great help to me particularly in his capacity as Head of the Institute where I did research. My thanks are due to him as well. In shapping the thesis in its final form and observing the methodological aspect I am indebted to Dr. K. Vijayan, Reader in Sanskrit, University of Kerala. It will be a dereliction of duty on my part if I do not Tanks Dr. K. V. Sarma of the Adyar Library and Research Institute who has taken personal interest in my work. I am grateful to Dr. N. P. Unni, Professor and Head of the Department of Sanskrit, University of Kerala and to Prof. M. K. Gangadharan, Professor of English, V. T. M. N. S. S. College, Dhanuvachapuram for the valuable suggestions I received from them. I express my sincere thanks to the authorities of the University of Kerala for granting me permission to publish the thesis. 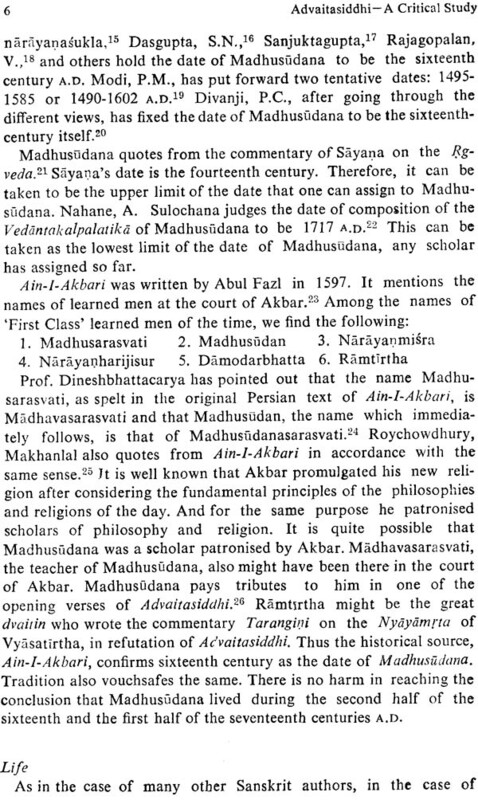 The name of the original thesis was 'Advaitasiddhi-A study'. The present book form is named 'Advaitasiddhi-A critical Study. This change has been effected taking the critical nature of the study into consideration. I am indebted to Dr. Asoke Chatterjee Sastri, Professor and Head of the Department of Sanskrit, University of Calcutta for the valuable suggestions I received form his. I am extremely thankful to him for favouring me with a brief but illuminating Foreword for the book. Thanks are due to Dr. L. Sulochana Devi and S. Geethamony Amma, Research Associate and Research Scholar respectively of my Department, for the help they did in preparing the Index. My obligation to Sri Satguru Publications, a division of Indian Books Centre, Delhi cannot be expressed by mere words. They have neatly executed the printing of the book in a record time. 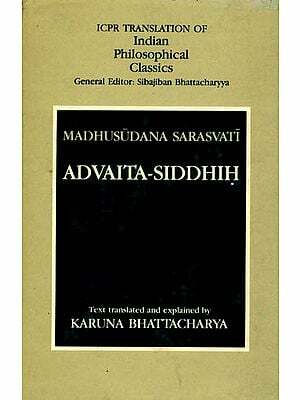 'Advaitasiddhi' is one of the most difficult abstruse book in the philosophical world. 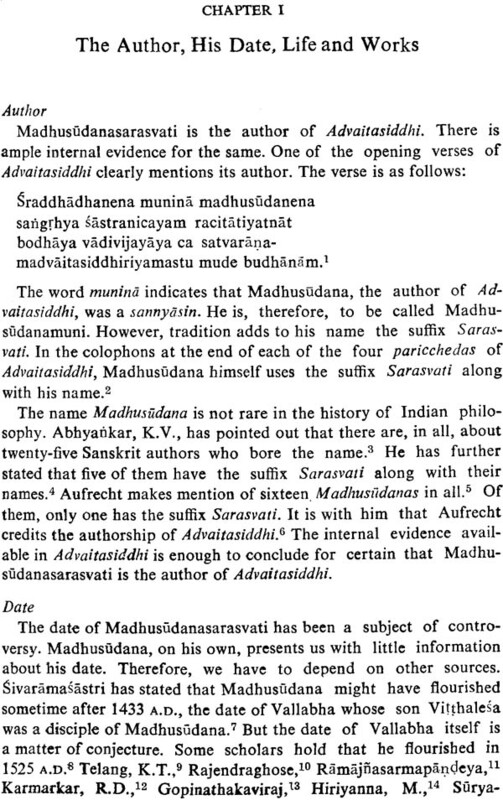 Sri Nair must be congratulated for the hazardous task of going through this entire text step by step and critically analysing the stand point of Madhusudana Sarasvati set against the background of the staunch antagonists of the advaita- vii dins. He has left no stones unturned to present his contention with as much conviction as possible. I must admit that his presenta- tion has demonstrated his technical mastery of his field of specialisa- tion and first-hand knowledge of the 'Advaitasiddhi' as well as its allied works. The presentation of the text itself is highly satisfactory, the application of research methodology is sound and the chapter- division is refreshing and instructive. Divided in as many as twelve chapters the work gives a short but coherent picture of the siddhi literature of the advaitavedanta school which is very interesting, important and informative. 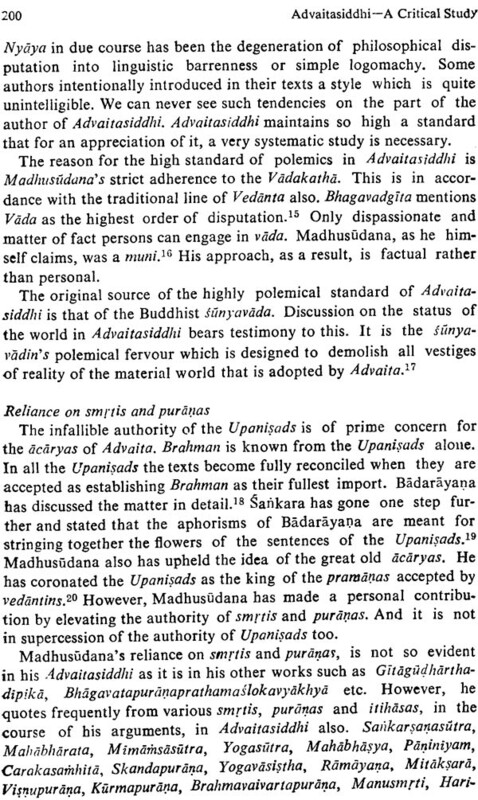 In the second part which is entitled as 'Textual Examination' Sri Nair has exhibited his brilliance in presenting the views of Madhusndana faithfully as delineated in the text of the 'Advaitasiddhi'. The material presented here deserves careful consideration. Sri Nair has scientifically marshalled the material and brought to light this abstruse text clearly and logically. The world today is in an unprecedented crisis. One principal view is that the advancement of science and technology, without any regard for human values, has brought about the present crisis. The solution put forward is the convergence of science and philosophy. Vedantic thought has assumed a new importance in this connection. During the last few years several important books dealing with the synthesis of science and Vedanta have appeared in India and abroad. It is not within the scope of the present thesis to compare Vedanta and modern science. However, one thing has to be specified here. There is no rule that science and philosophy should always stand at variance. Philosophy can well become a genuine science. But the so- called modern synthetic approach to Vedanta and science is often at the risk of objectivity. Vedanta is not completely out of the reach of the scientist. 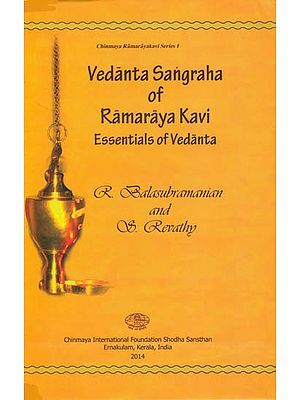 However, any scientist who wants to pass judgements on Vedanta has to acquire a good knowledge of it. It is not an easy job too. The Vedanta, although frequently quoted, is little known to the people at large. Therefore, they are often made to believe anything and everything in the name of Vedanta. Many people take Sankara's Vedanta as representative of the whole of Indian thought. By doing so not only objectivity but historicity is also neglected. Even the basic difference of idealism and materialism is ignored; not to speak of other differences in details. It has become a widespread tendency to depict Indian philosophy, in total, as essentially spiritual. This will not serve the larger interests of our country. Only a realistic approach, to Indian philosophy as a whole and to Vedanta in parti- cular, will be in consonance with the present-day philosophical needs of our people. The study of Indian philosophy should reveal the rich and varied philosophical heritage of India. From the very beginning, there have been a large number of philosophical views in our country. Indian philosophy represents an abundance of contradictory stand-points. 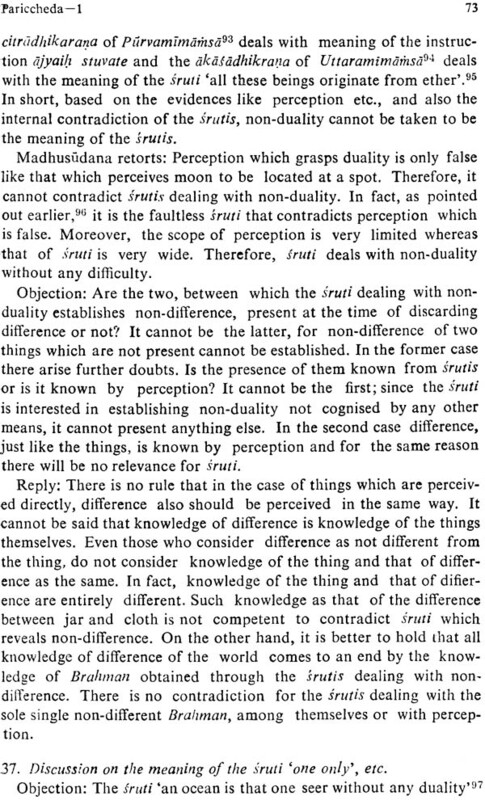 Contradiction has always been the motive force in Indian philosophy. There is difference of opinion regarding the number of Indian philosophical systems. Kautilya mentions in his Arthasastra only three systems: Sankhya, Yoga and Lokayata. 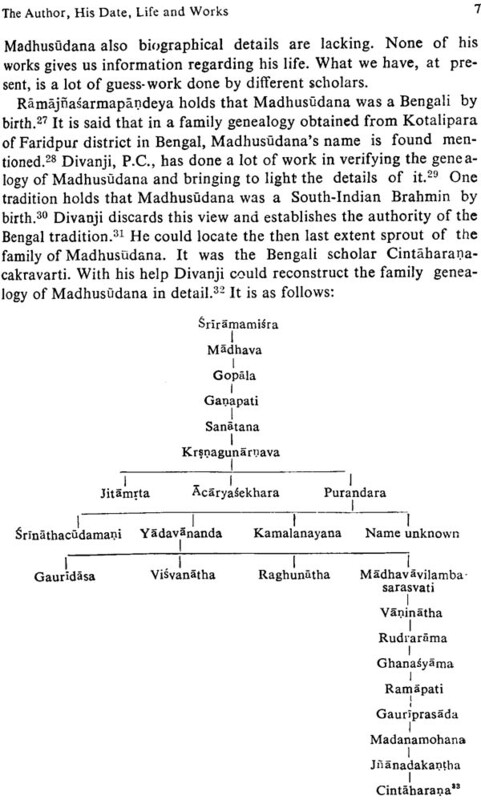 Madhava in his Sarva- darsanasangraha, deals with sixteen systems. The traditional way is to treat Indian philosophy as nine distinct systems of basic impor- tance. These are the Carvaka, the Jaina, the Bauddha, the Sankhya, the Yoga, the Nyaya, the Vaisesika, the Mimamsa and the Vedanta. The nine systems are grouped under two broad heads: astika and nastika. Among the nine systems mentioned, the first three form the nasiika group and the remaining six the astika. Each of the nine sys- tems, in due course, split into many schools and sub-schools on the basis of doctrinal differences. The Vedanta, which is only one of the astika systems, has many varieties. Three of them, namely, Advaita, Visistadvaita and Dvaita are more important. All these rely mainly on the Prasthanatraya, namely, the Upanisads, Brahmasutras and Bhagavadgita, as their authoritative texts. The Upanisads contain elements of a number of philosophical systems. The first comprehensive attempt to evolve a consistent philosophy out of the Upanisads was made by Badarayana (second century B.C.) in his Brahmasutras. On account of their being aphoris- tic Brahmasutras are not easily intelligible. 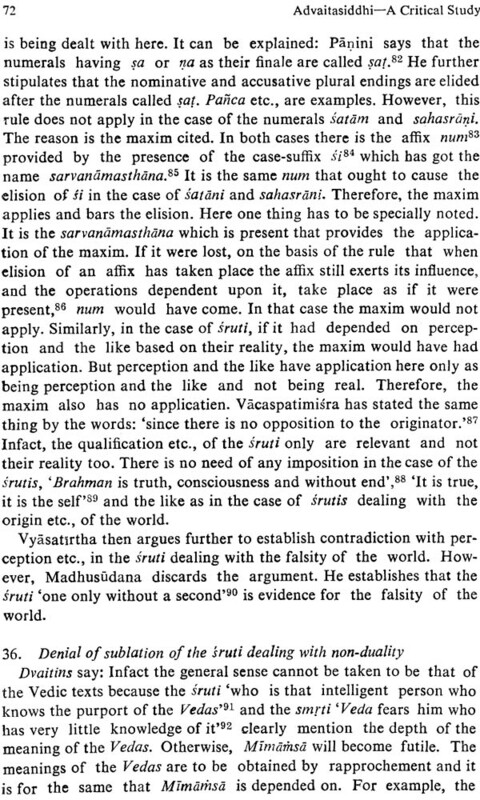 As a result, there origi- nated a number of commentaries on Brahmasutras, Advaitins, visista- dvaitins and dvaitins interpret the sutras differently. The same is the case with the Upanisads as well as Bhagavadgita.